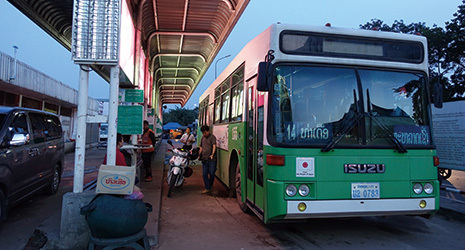 A bus company in Saitama Prefecture is helping to improve bus operations in Vientiane, the capital of Laos. Based in Kawagoe City, Saitama Prefecture, Eagle Bus Co., Ltd. has attracted much attention for its efforts to successfully revitalize the regular scheduled bus business. Eagle Bus has positioned courtesy buses and sightseeing buses at the center of its operations based on one of its core corporate principles, which is promoting the company’s contributions to the public through business. In 2006, Eagle Bus entered the regular scheduled bus business, taking over unprofitable routes from a leading bus company that had given up on them. To turn the business around, Eagle Bus equipped these scheduled buses with GPS and infrared sensors to collect various data such as the numbers of passengers getting on and off at the respective bus stops and the state of operational delays, and conducted a questionnaire survey of the bus users. Then, using software they developed in house, they analyzed the collected data, reorganized the bus timetables, optimized the locations of the bus stops and modified the route operations as well. Through these steps, Eagle Bus reduced costs and increased the number of bus users at the same time. The company was able to improve its income and reduce its expenditure for the deficit-ridden bus routes as a result. 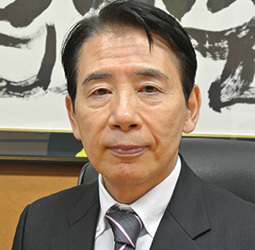 “You can reform the regular scheduled bus business by visualizing matters such as bus operation data, passenger demands, costs and improvement processes,” points out Masaru Yajima, president of Eagle Bus. The Japan International Cooperation Agency (JICA) took note of the bus business improvement carried out by Eagle Bus. JICA launched the Project of Improvement of Transportation Capacity of Public Bus in Vientiane Capital as a technical cooperation project in 2012. Through this Project, the Agency supplied the public bus corporation in Vientiane, the capital of Laos, with forty-two buses in the form of grant aid. As in other Asian countries, traffic jams had worsened in Vientiane in recent years due to the rapid increase in the numbers of private cars and motorcycles. At the same time, the number of regular scheduled bus users had decreased sharply because of traffic jams and poor-quality bus service. The JICA technical cooperation project was aimed at improving the administration, financial affairs and services of the public bus corporation and paving the way for increasing the number of bus passengers and alleviating traffic jams. At JICA’s request, Eagle Bus accepted a group of inspectors from Laos in 2014, introduced their improvement method to the group, took part in a traffic seminar held in Laos the following year based on a request from the Laotian side, and gave a presentation there explaining how the company had improved its regular scheduled bus business. The Laos side showed extremely strong interest in this presentation. “I developed the desire to try and see directly whether or not our visualization approach would be effective in Laos,” explains Yajima. As a project under JICA’s Support for Japanese SMEs Overseas Business Development program, a Feasibility Survey for the Improvement of Vientiane Capital State Bus Enterprise Infrastructure in Lao PDR was launched in 2014 with Eagle Bus as the primary contractor. Measures for Improvement began in 2016 after the Verification Survey with the Private Sector for Disseminating Japanese Technologies for a Base Operation Improvement System based on one year of research. Eagle Bus equipped forty-two buses with sensors and on-board cameras in September 2016 and began collecting operational data two months later. Using these tools, Eagle Bus found that the public bus corporation did not operate its buses according to the routes and timetables it had set, and that the number of buses operated differed each day. The company also learned that passengers got on and off the buses on the street instead of using bus stops. This practice resulted from the salary system whereby bus drivers were paid according to work quotas. In addition to these points, Eagle Bus discovered that the buses were kept in standby mode for a long time due to an inappropriate operational plan and that they consumed more fuel than required for the distances covered because the engines were left running idle for long periods of time to cool the bus interiors. Based on this data, Eagle Bus worked on an improvement plan with the public bus corporation. It changed the bus routes, moved and erected bus stops, shortened bus standby times on routes on which reform was possible, and moved standby areas to shaded locations. Through these measures, fuel efficiency was improved and exhaust gas was reduced effectively. However, improvements in areas such as bus drivers’ manners and services were difficult under the existing conditions. City 2 was established within the public bus corporation as an organization in charge of bus operations on new routes in August 2017 with the support of JICA and Eagle Bus for that reason. 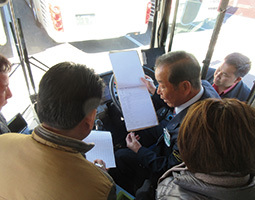 The new organization introduced Japanese bus services and systems for managing bus operations extensively and began operating twenty-five secondhand buses donated by Kyoto City in December 2017. City 2 also began operating a bus route linking the center of Vientiane with the airport on January 18, 2018. City 2 introduced Japanese-style services on this route, such as greetings by drivers and on-board announcements. Eagle Bus has also been taking part in a bus support project launched by JICA in Cambodia since 2017 as an advisor. The company’s concept of making social contributions through its bus business is about to spread to other Asian countries as well.